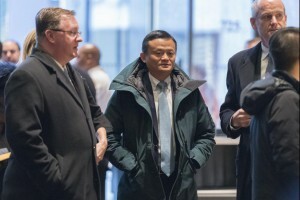 Chinese billionaire and Alibaba founder Jack Ma said a pledge to create 1 million new jobs in the United States won’t happen, thanks to President Donald Trump’s tough stance on trade with Beijing. Ma told China’s Xinhua news agency Wednesday the promise he made — shortly before Trump took office — was based on friendly cooperation between the United States and China and rational growth for China-U.S. trade. “The previous basis for trade has been undermined,” he told Xinhua. “But we will continue to work hard to promote the healthy development of China-U.S. trade. Ma made the original pledge at a high-profile meeting with then-president-elect Trump in Manhattan in January 2017, 11 days before his inauguration. The trade war escalated this week as China announced 10 percent tariffs on $60 billion worth of U.S. imports — retaliation for Trump’s tariffs a day earlier. Ma expressed growing concern that the conflict might last for a long time. “It’s going to last long, it’s going to be a mess,” he said. This month, Ma announced his retirement as Alibaba’s executive chairman. He will remain on the company’s board of directors. Ma founded Alibaba in his apartment in 1999 with several friends. The e-commerce company is now one of the world’s largest and focuses on other niches like technology and autonomous vehicles. He resigned as CEO five years ago, but remained the public face of the company, which has a market value of more than $400 billion. Ma, a former English teacher, said he now wants to focus on his first love of teaching and create a foundation for education philanthropy — similar to the efforts of billionaire Bill Gates.